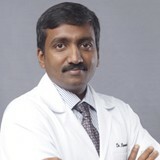 Dr. Ramakrishna Kaklavaram had received fellowship trained in Arthroscopy of Shoulder and Knee and Arthroplasty of Joints from the Emeritus – King's College of London, UK. He is AO Fellowship (Swiss) trained in Orthopedic trauma. He previously held full license to practice in UK and is still registered with GMC, UK. Dr. Ramakrishna has more than 15 years of experience in the field of Orthopedics including an Observership at Royal Orthopedic Hospital, Birmingham, UK. He obtained his MS (Ortho) from Government Medical College, Bellary (VIMS). He has also worked as a Orthopedic consultant in many corporate hospitals in Bengaluru, India and was a faculty for Post Graduate students in Medical Colleges. During his career, he has done many complex arthroscopic shoulder and knee surgeries, many complex trauma and joint replacements. He also has a number of research and publications to his credit. He is fluent in English, Hindi, Arabic, Kannada and Telugu.